How to make lemmon cheescakes. 14 Take the rines of 2 Lemmons boyl them tender beat them in a marbell morter than add one half a pound of Allmonds beat to a paist with orangeflower watter then add 8 eggs taking away half of y.e whits well beat and strain them throw a haire sive then take half a pound of Loaf suggar & half a pound of butter melted & clean scum'd then mix them altogether in the morter & so backe them in thin suggar paist in pans To Make Black Pudding 15 Take 3 pints of blood put to it a quart of shirmen groats the same measure with the blood put yor groats & blood together lett them stand all night to steep. 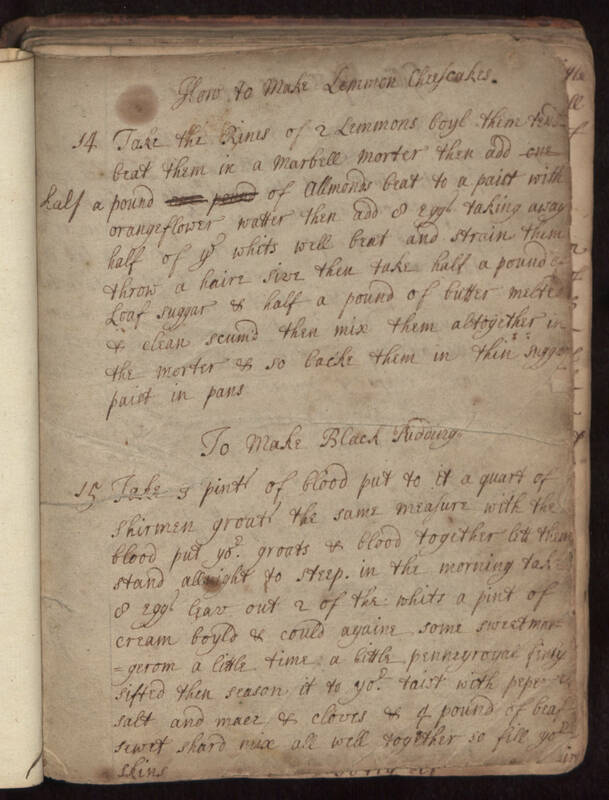 in the morning take 8 eggs leav out 2 of the whits a pint of cream boyld & could againe some sweet margerom a little time a little pennyroyal finely sifted then season it to yor taist with peper salt and mace & cloves & 4 pound of beaf sewet shard mix all well together so fill yor skins.